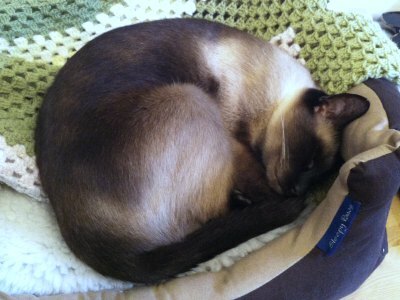 Welcome to May's Meezer Musings! It was one of those times (I'm sure you know the ones) when you hit a series of bumps in the road of life - I was ill for a few weeks, there was a family crisis, various friends had various difficulties - everything seemed to happen at once. To make matters worse, our internet connection was on and off (mostly off) for six weeks. Two obliging telecoms engineers eventually turned up and replaced all the wiring, which in places looked like it had been chewed by squirrels. And now we're all connected up again. All of which made things a little tricky for a while. So here we are, nearly at the end of May. 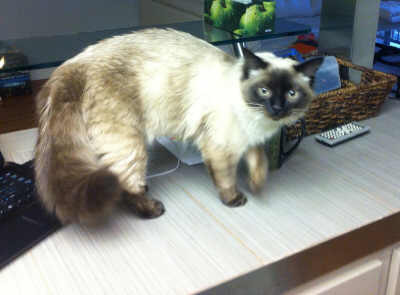 April Fool's Day is as good a day as any for a Siamese cat to enter your life. In fact it's probably a highly appropriate one! 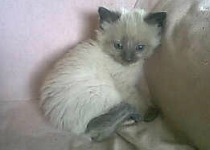 Six years ago, on April 1st 2008, I got into my car and made a four-hour round trip to collect a Seal Point Siamese cat I'd arranged to adopt from my closest Siamese Rescue. That cat was Bandit. Bandit today. Not a care in the world! He wasn't called Bandit back then. He didn't have a name at all. He'd been with the Rescue for about four months but because he was a stray when he was found they hadn't given him a name, preferring to wait until he was either claimed by his owners, or someone adopted him. He never was claimed, and the someone who adopted him was me. I didn't know then quite how much my life was about to change. I never thought much about owning a cat before I had Bandit. How difficult could it be? I'd had cats before, but the responsibility for them had never been fully mine. Little did I know! Just how LOUD an excited, frustrated or angry Siamese can be! I'm sure some would say that my life might have been better off without knowing anything of these things, but I wouldn't have missed them (and all the cuddles) for the world. Life might have been easier if I'd started from the beginning (I was going to say from scratch!) with a kitten, but the journey with Bandit has been very rewarding, and it's made me a big fan of adopting rescued cats - there are so very many of them in need of help. The Spring is known as 'kitten season' by rescue centers and shelters. It's the time when feral cats have their kittens in the wild, and it's also the time when kittens bought as cuddly Christmas presents start turning into not-so-cute adult cats, and risk being dumped or abandoned as a result. 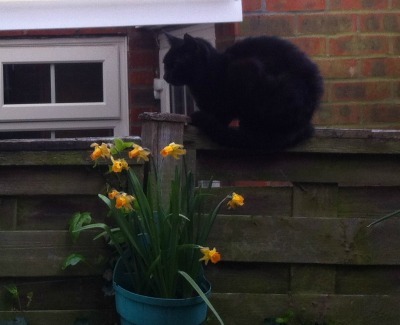 A few weeks ago, a just-older-than-kitten, black male stray cat wandered into my garden. 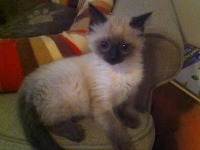 He wasn't neutered and had obviously been beaten up by other cats. Skinny and starving, but very friendly, he clearly wasn't in a hurry to leave again. We couldn't have him in the house - stray cats often carry diseases and fleas - so I gave him some food and made up a bed for him in a box to provide some shelter for him outside overnight. Next morning he was still there, and still very hungry. I would have liked to keep him, but Bandit isn't fond of other cats in his territory. He was already howling the place down at the thought of another cat in his garden! So after phoning all the local vets to make sure the little cat hadn't been reported missing, I turned him over to a local shelter where he'll be looked after, fed, neutered and eventually put up for re-homing. In the course of putting this website together I've come up with a list of Siamese rescue centers around the world. From time to time I drop in on their websites and Facebook pages to see what's going on in their world - the dedication of rescue staff always amazes and inspires me. Most of them are volunteers who spend their time raising money (as you can imagine, the need for funds is endless), rescuing cats, providing veterinary care, cleaning out cages, socializing, and very often providing transport for the cats to get to their new owners. They're always in need of help, so do take a look at the list to see if there's a center near you, and if so please consider offering them a little of your time, money, or even a donation of cat food or blankets. One of our readers, Di, wrote in about a cat collar she'd bought from Amazon. Made by Red Dingo, this particular collar is designed with a safety release, but Di noticed that where the fabric of the collar was older and softer, it had looped at the back (where the fabric doubles over). The safety catch would no longer release and the collar was throttling her cat. She reported this to Amazon, who promised to look into the issue, but she also wanted to pass on the warning to other owners in case of any future problems. I've always been a little wary of collars with safety catches, so please do test the collars you buy to make sure they fit well (you should be able to get two fingers between the collar and your cat) and especially that the safety catches work properly and release easily. 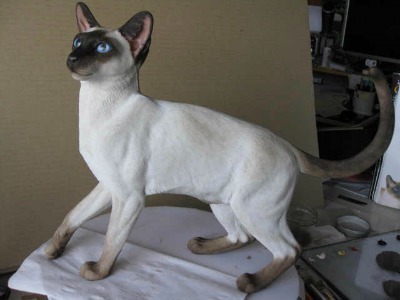 Di also mentioned that she'd bought a beautiful Siamese cat sculpture by UK artist and sculptor Catherine Dow. Painted to look like Di's eldest cat, Meeko, Di says it looks even better 'in the flesh'. It does look gorgeous and has really captured all the little details so well. Regular reader and visitor to our Facebook page Glenn Duffy stopped by to say hi and to send in some pictures of his Balinese cat Nicci, who we first saw as a kitten, above. From a thoroughly cute and adorable little munchkin, Nicci has grown into a gorgeous cat (check out that Balinese tail) and thoroughly deserves to be our Meezer of the Month. Our cat show section of the newsletter has been moved and given its own full page on the website - if you're looking for the cat shows, you'll find them here. With any luck and hopefully an easier time over the next few weeks, we'll be back on track in June, and sometime in the next couple of months I hope to have some fun news for fans of Doreen Tovey's books. Stay tuned, as they say ... and have a glorious June meanwhile!